A two-day getaway for summer fun in Chicago with kids — indoors and out! 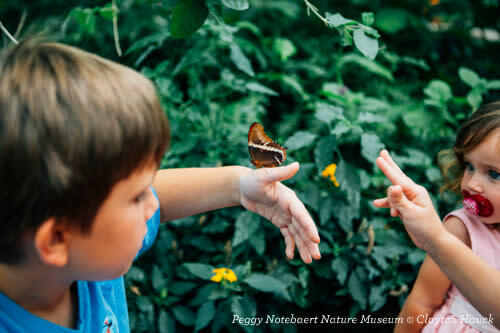 Find things to do in Chicago with kids right here! For summer seasonal picks, do a day outdoors — a massive whimsical playground, a new Ferris wheel with gondolas that fit the whole family, shopping the famed Michigan Avenue strip for a new Elsa or American Girl doll. 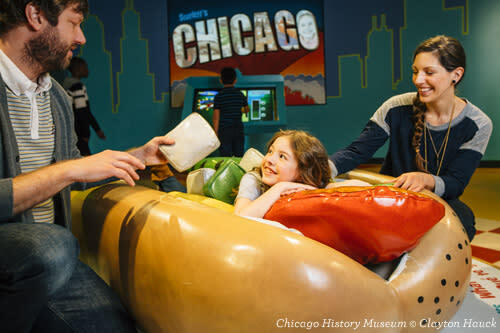 Then have some interactive fun — pet a goat, make friends with butterflies, even layer up into a giant Chicago hot dog! Build out your own Chicago family-friendly itinerary, or go the easy route with this ready-to-go guide. Berry Good Eats. Kick off the adventure right at Wildberry Pancakes & Café, which has plenty of grown-up options if you can manage to pass up the specialty pancakes — Oreo S&apos;More, Banana Cream Pie and Tiramisu among them. Daley Dose. 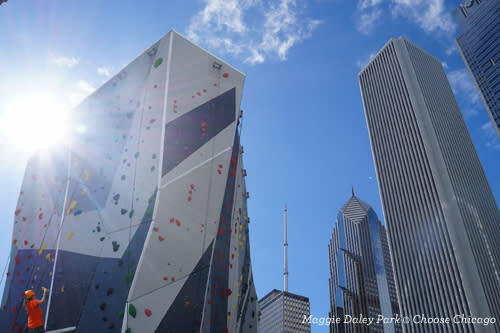 The three-acre Play Garden at Maggie Daley Park has wondrous themed spaces for various ages, including a Watering Hole for toddlers and a Slide Crater and climbing wall for bigger kids. Pier Pressure. Grab a quick lunch at Big City Chicken on Navy Pier before exploring the beloved Chicago landmark — celebrating its centennial in 2016 with a brand-new Ferris wheel. The award-winning Chicago Children&apos;s Museum is here, along with Amazing Chicago&apos;s Funhouse Maze. Magnificent Heaven. Has everybody been good? REALLY good? 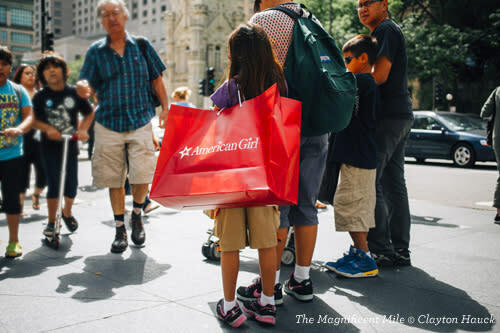 Well then it&apos;s off to The Magnificent Mile for a kid-focused shopping excursion — options include The Disney Store, the LEGO Store, American Girl Place, Garrett Popcorn and Candyality. Top off a great afternoon with a trip to 360 CHICAGO&apos;s observation deck. Good Sports. Tonight&apos;s dinner is a 2-for-1 special: Harry Caray&apos;s 7th Inning Stretch, on the top floor of Water Tower Place, is conveniently attached to the fully-interactive game zone and memorabilia emporium, Chicago Sports Museum. Pool Party. The centrally located InterContinental Chicago Magnificent Mile has a heated indoor pool for them and a spa/health club for you. DAY 2: PARKS, BEACHES & ZOOS... OH MY! Square Meal. Belgian waffles and French toast are the heroes at Batter & Berries, a cozy Lincoln Park breakfast spot with something for everyone. Play List. Now it&apos;s off to Lincoln Park — 1,208 acres of gorgeously landscaped lakefront land with a delightfully long to-do list. Start at the free Lincoln Park Zoo and be sure to visit the cows, pigs and goats at Farm-in-the-Zoo. Beach Break. 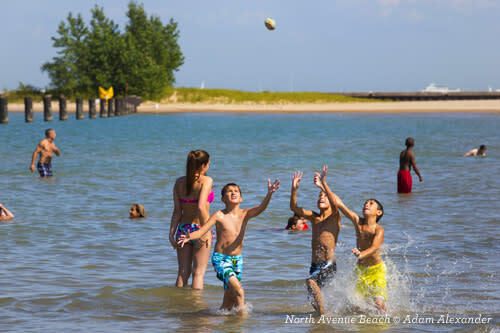 Before lunch, let the kids grab a quick dip in the cool waters of Lake Michigan at North Avenue Beach. Family Fare. With massive burgers and a salad bar boasting more than 50 fresh ingredients daily, R.J. Grunts is a sure thing for lunch with the kids. Museum Muses. The Peggy Notebaert Nature Museum caters to knee-high naturalists, with hands-on exhibits (touch butterflies, crawl through caves, build your own dam) nature trails and live animal feedings; the Chicago History Museum also has much to offer the smaller set, including an interactive bridge-building station. Home Slice. No trip to Chicago is complete without pizza, and the golden-crusted pies from Stella Barra Pizzeria are among the best; dough is made daily, and there are lots of creative toppings to keep mom and dad happy. Good Sportz. Close out your weekend with an early show at ComedySportz, a hilarious 90-minute improv comedy show (for all ages!) in which two teams create scenes, songs and games right on the spot based on your suggestions.